What’s the most cost effective way of catching the attention of new customers? 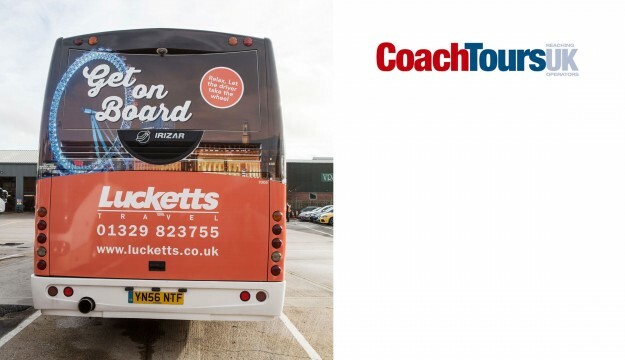 It’s a question that Lucketts Travel Group has answered with a colourful new campaign that makes the most of its assets; turning local buses and coaches into fun moving billboards for an ever growing list of holidays, city breaks and excursions. Aspirational images have been carefully chosen to catch the attention of anyone seeing one of ten vehicles based at the companies Fareham HQ. The double deck buses and coaches all operate on routes in and around Hampshire, guaranteeing a wide audience for the new campaign. The high impact adverts all carry Lucketts Travel Group tagline “Get on Board”, and feature striking pictures of well-known attractions, landscapes and holiday destinations. Each image also carries a catchy slogan, relating to the picture that potential passengers are looking at. The designs highlight different areas of Lucketts Travel Group business – Group Travel, Theatre Trips, Holidays, and Day Excursions. There’s also an advert for new drivers. It’s a great way of recruiting staff, reminding them that the family run firm offers free training and competitive salaries. The adverts are a mix of full colour ‘back wraps’, long panels and ’T’ panels. The bright and colourful campaign is accompanied by a new range of Lucketts Travel Group merchandise. Teddy Bears and mugs have already arrived which customers are sure to love. Lucketts Travel is the leading coach travel group on the South Coast of England. Established in 1926, it is a family owned business and employs over 300 employees across Fareham and Worthing and Southampton.